Today was an important one in the life of the TRS with the commission number, X654, as its restoration began today. It will be worked on by Randy Phillippi and some of his associates, and the TRS body shell left its long-time home in our barn today on its way to Randy’s shop. Albert and I spent a couple of hours talking about this project and searching our storage areas for parts belonging to the car and to its sister, X657, which sits on display in the TRF showroom. The engines and gearboxes have been removed from both cars, and tonight we located the gearboxes and other items where they are stored in the TRF warehouse. It has been a strain for me to know that the two cars have been disassembled for many years, and completing their restoration is one of my lifetime goals. I will turn sixty-six this year, and it is time to get started. This will not be a chore but a labor of love, and I am glad to see the work beginning. Albert is almost beside himself with excitement. The most exciting thing this week has been spending time with Randy Phillippi on the TRS restoration project. Randy is very excited to have a piece of history in his garage, and I spent a couple of hours with him and Marilyn on Wednesday. 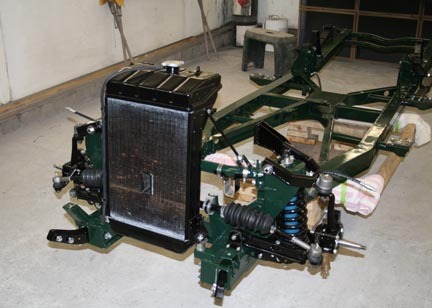 Randy had the body assembled on a trial basis and installed on the chassis frame. 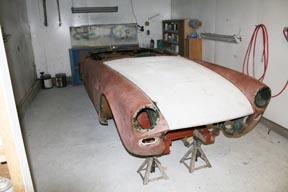 The Photo of the Week is the body shell on the chassis. with fenders, doors, and bonnet installed. Actually, the bare chassis is off the car now, and Randy is making some repairs to it. It had been scraped on a curb sometime, and someone had cut off the LeMans jacking brackets in the rear. I stopped by his place this afternoon to find him examining the front brake calipers. 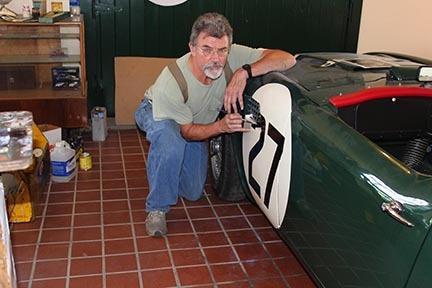 Dave Hagenbuch had given Randy a short film of the 1961 LeMans race that had been produced by Standard Triumph. It is so exciting to see the cars ripping around the track along with Ferrari, Lotus, Porsche, Jaguar, and others. I was thinking of ways to get copies of the film made, but then John Swauger found that it is on YouTube. You can see it yourself by using the link provided, http://www.youtube.com/watch?v=VGfQOLFHgYE, or view it below. 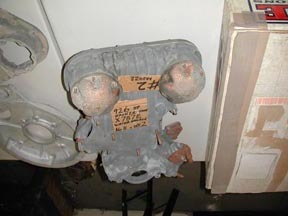 We have now located nearly all of the TRS parts which came to us with the car originally. By the way, it is the one with the white front in the film. The only really critical part that is missing is the windscreen. I am mentioning it here because I know how serious many guys are in California where the car was found. If anyone knows anything about the current location of the windscreen frame, I would be very grateful for information. 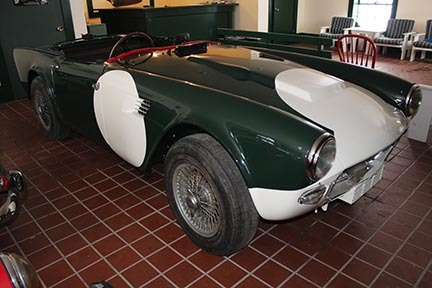 It is made a lot like a TR3 frame, but the glass and frame are shaped very much like a TR4 windscreen. 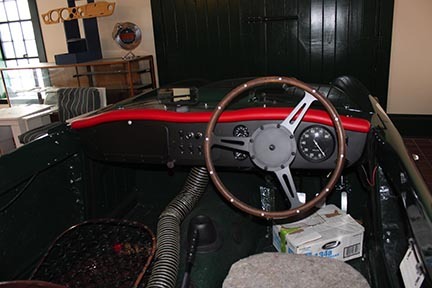 The frame is aluminium, it is painted black, and it has the sort of snaps fitted to original TR2, TR3 aluminium windscreen frames. I would be happy to pay a finder’s fee to anyone who provides information leading to its acquisition. 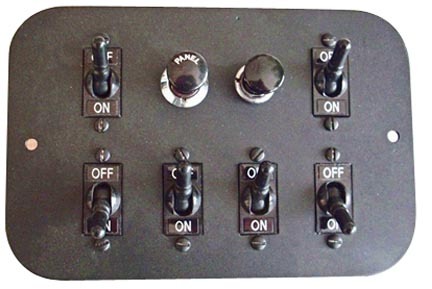 If we don’t find it, we will find a way to have one made, I am sure, but having the original would be a major coup. 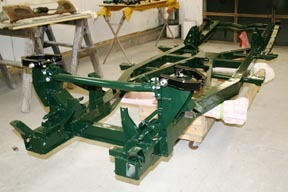 While I was away, the chassis frame of the Triumph TRS LeMans car with the commission number of X654 was sandblasted, primed and painted in British Racing Green—on these racing cars, the chassis frames were painted the same colour as the car bodies, but many of the bolt-on parts were black, as you can see from these photos taken by John Swauger in Randy Phillippi’s shop. 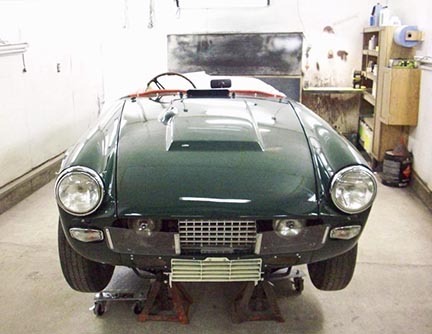 If you have a TR3 or TR4 sports car, and you have seen its bare frame, the TRS frame in the photo posted on the web site will look familiar to you. 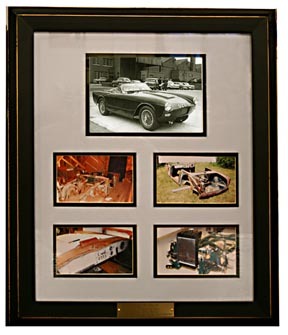 This TRS frame was made from one of the TR3S frames used on the LeMans cars of 1959. 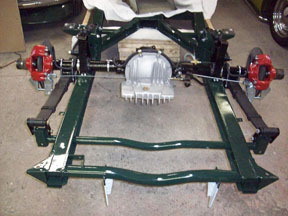 TR3 frames were lengthened to accommodate the “Sabrina” twin-cam engines for TR3S models, and later they were also widened to accommodate the wider track of the TRS models. The scars of this surgery are still quite visible on the chassis frame of X654. 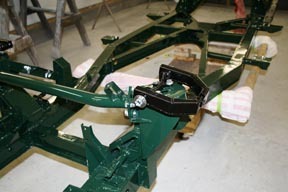 In addition to lengthening and widening, the TRS chassis frames had additional steel channels welded to the undersides of the frame rails to further stiffen the chassis, also making it pretty heavy for running on a smooth race track. 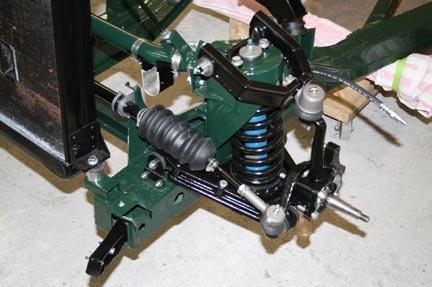 The photo also shows the beginning of the assembly work on the front suspension. 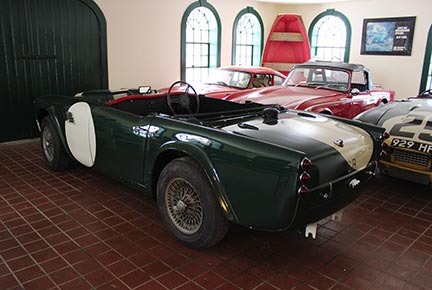 Our goal is to make this car a tribute to Triumph’s quality and workmanship—to make it perfect without over-restoration. We are honoured to be entrusted with this work, as we are amazed at being selected by Fate to be the ones to do it. 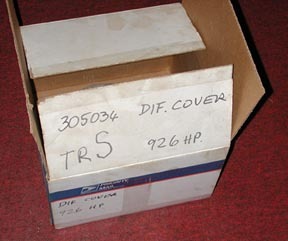 The diff arrived from England this week, and Randy picked it up within an hour. My include one loaded on Randy’s truck just as it came. Another Photo shows it with the brake back plates stripped off and the finned alloy cover fitted. 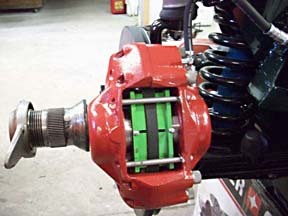 It was fitted just to make sure that it fits, and then the entire diff went to Tom Spadafora’s shop for a complete teardown and reassembly with new bearings. 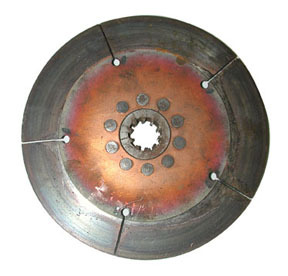 Thankfully, we have all of the brackets and calipers for the rear disc brakes. On Christmas Eve, I met with TRF Staff to hand out our traditional turkeys and hams. The Staff, in turn, presented me with truly wonderful gifts instigated by Bill Lynn, Membership Secretary of the Vintage Triumph Register. 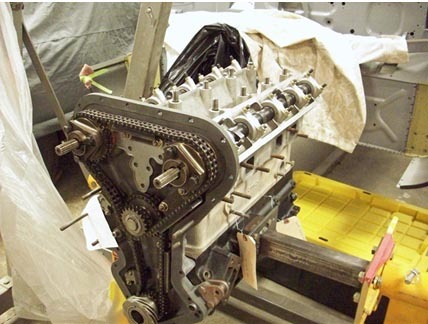 It seems that Bill provided two archival photographs of 926HP aka X654, the TRS currently under restoration under the direction of Randy Phillippi for TRF. 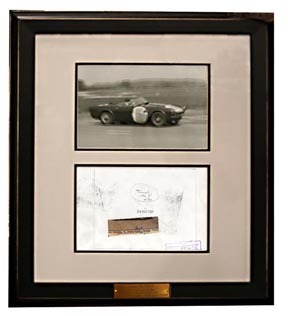 One photo has a notation on the back that Ken Richardson is at the wheel of the car at speed. Ken appears to be wearing a tweed motoring cap, and the racing numbers on the car are blanked out. 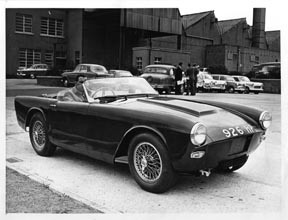 The other photo was taken with factory buildings in the background, apparently the Triumph factory at Canley, Coventry. TRF staff mounted the archival photographs along with more current photos of the car as it came out of storage in the barn at Runyan’s Farm. The groups of photos will be hung on the wall in the TRF showroom beside the rolling chassis when it returns in the new year from Randy Phillippi’s workshop. All of you will be able to see everything if you visit TRF or if you attend Summer Party 2013. Progress since last week is evident, as front suspension, steering rack, rear springs and shocks, cooling radiator, and small details have been added. 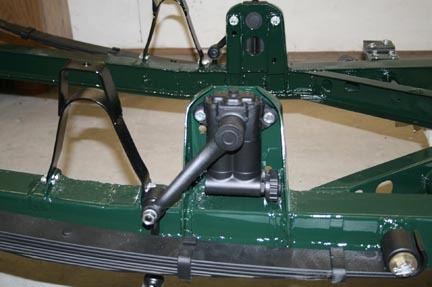 The first steering rack conversion fitted to a “TR3” frame. 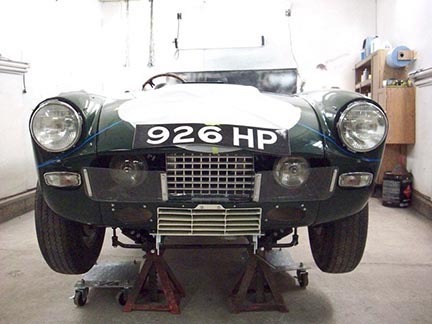 Suspension is like TR3 in many ways, same trunnions, ball joints, and lower wishbones. The suspension is cunningly slanted by three degrees but by a different method than on later TR4 models. 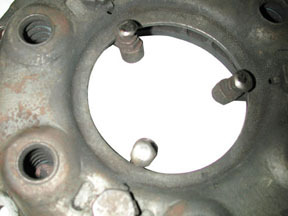 In this case, the lower inner fulcrum pin is slanted, and the upper wishbones are modified to induce a three degree castor angle. 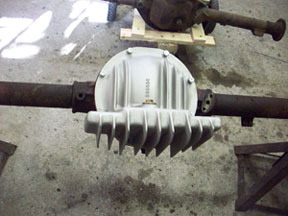 Steering rack mountings are similar to TR4. More critical nuts and bolts are secured with slotted nuts and cotter pins, and heads of bolts are drilled and lockwired. The four bolts which secure the upper wishbones on each side are lockwired together. Rear shock absorbers are adjustable Armstrong units, as you will note from the adjusting knob at the lower rear corner. Shocks are secured with drilled bolts and slotted nuts with cotter pins. This would make a good fix for all TR2 through TR6 models too, as shocks often come loose on all of these. 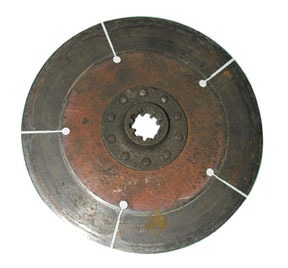 Rear springs are similar to TR4, but they are stronger, and they include an additional leaf. 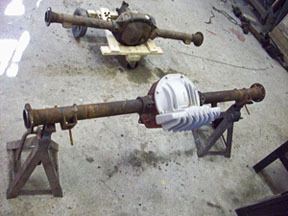 The rear axle has not been installed, and we are looking for a Standard Vanguard Series 2 rear axle, as the original rear axle had been modified beyond recognition. 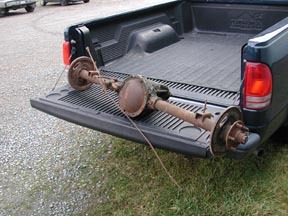 If anyone has access to an available axle, please let us know. If it needs rebuilding, we can probably handle that. 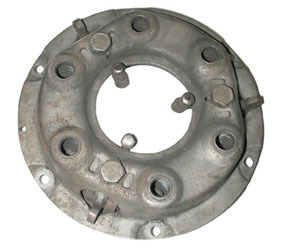 We could also use photocopies of workshop manual sections and Triumph spare parts catalogue sections for this axle. Any help from the Triumph community would be sincerely appreciated. Over the past couple of months, I have covered the process of acquiring and restoring the correct rear axle for the TRS racing car. 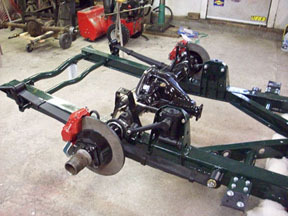 The axle was finished and installed on the chassis frame this week, and yes, I have photos of the complete axle from end to end with hubs, brake discs, calipers, and hydraulic lines all installed. The set-up on the TRS was, of course, the first rear disc brake conversion, and Triumph accomplished it very neatly. All of the hydraulic lines on the car are sheathed in rubber hoses, and I will include a photo to illustrate how this was done and how it looks. 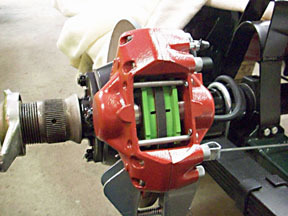 By the way, it is our custom at TRF to paint all brake calipers and all brake drums in red. I believe that we have been doing this for much longer than AP high-performance calipers have been painted red on Minis, Morgans, etc. 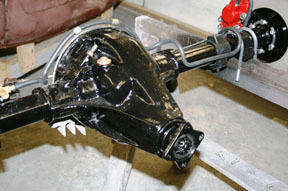 Ah yes, the rear axle is proudly sporting its finned alloy diff cover, and doesn’t it look wonderful? 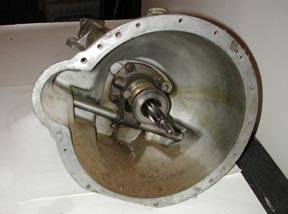 The old rear axle fitted to our TRS included a “new” differential with racing gears and a “locker.” The axle had been modified for the TRS by welding on the Triumph outer hub flanges, and the job had been done very well. 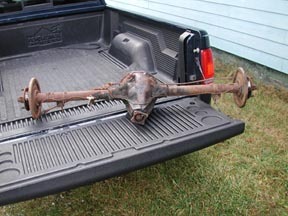 This axle is now available to a Triumph racer if anyone wants it. It is the width of a TR4, and we would like to get about $1,000.00 or best offer for it. This money will go back into our project. A peripheral issue that has interested me for years is the “S” in TRS! My friend, John Ames has given a lot of thought to this matter too, and it is his opinion that it stands for “Sabrina,” the nickname given to the new twin-cam engine by Triumph factory engineers during its development. I have seen some internet photos of a popular English model, actress, and movie star of the 1960’s who was known as Sabrina, and when I get a chance, I will post some photos of the engine and the star, so that you will understand the connection made by the Triumph engineers. Sabrina, born as Norma Ann Sykes in Cheshire in 1936, is apparently live and well and residing in Hollywood, California. “Sabrina” is a phenomenon in her own right apparently, and the internet is loaded with information about her. I doubt that you will have any trouble finding some photos on your own if you are so inclined. The most interesting thing that did happen this week was continuation of the TRS LeMans car project. Randy and I drove to a high-end restoration shop here in Western Pennsylvania on Monday, and I feel sure that we have found someone, fairly close to home, who can do this work. Then Randy spent parts of several days unpacking boxes of Sabrina engine parts for sorting before transporting them to the shop. We have about three full engines, although there is some damage to one of them, and we have a good many extra parts. We do not have many gaskets, bearings, and fitting components that will have to be provided or sourced by the rebuild shop after determining what is required. For those of you who do not know, the Sabrina engine is a twin overhead cam engine of Triumph design which includes a layered construction of magnesium and aluminium components. 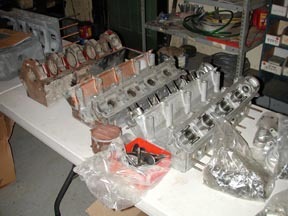 A cast oil pan, a crankcase, a cylinder block, a water jacket, and a cylinder head. 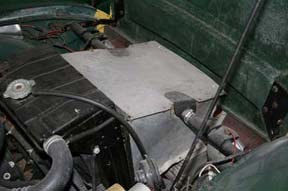 Versions of this engine were used at LeMans in 1959 in the TR3S cars and in 1960 and 1961 in the TRS cars. The engine was made in very short numbers, it was still under development, and just with the parts we have, there is a good bit of variation in details from one engine to another. 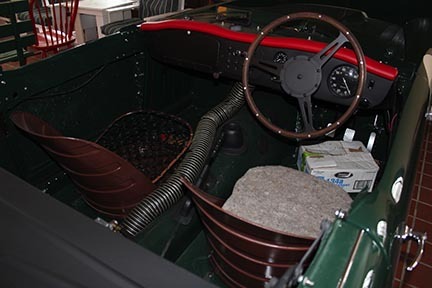 The engine has “wet” liners like a TR3, the crankshafts are forged, and the rods are massive compared to “tractor engine” rods used in TR2, TR3, TR4, and TR4A. I will get more photos of parts as they are sorted, but I have a couple that I will post this week. These show parts just as they were unpacked from boxes in which they have been stored for more than twelve years. A common item of interest is the engine’s name, “Sabrina.” This sobriquet was applied by the Triumph engineers working on the engine design and construction, and it relates to a popular actress and model of the 1950’s and 1960’s. She was born as Norma Ann Sykes in Cheshire in 1936, and she reached a high level of stardom in the UK in the late 1950’s and beyond. Apparently, the engine designers and mechanics saw similarities between their design and the body of this star. I am including a photo of Norma Ann along with my photos of engine parts this week, and I will let readers decide for themselves whether or not the nickname is appropriate. 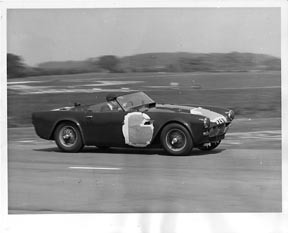 It was, it seems, considered appropriate enough by the “powers that were” at Triumph for the car to be called TRS, with the “S” standing for Sabrina. Over the past week, I received an e-mail from a customer who wonders what became of the TRS cars after the LeMans race up until the time that two of them came into my own hands and two of them went into the hands of Mike Otto in Germany. Having already got near to my limit for this week, that will remain a story for another week, and what I know is really quite sketchy, although I know more about some cars than about others. If anyone has specific knowledge about particular cars, including owners, racing history, etc., I would like to hear from you. I will try to piece together as much as possible and present what I learn in future newsletters or in a separate file on the web site. None of us has any idea how the carbs could have left our building, why they would have left, or when they might have gone. It is hard for us to believe that they could have been picked up by accident and trashed. If any reader has any memory of any circumstance that might have a bearing on this subject, If the carbs are lost, we will possibly recover by rebuilding another badly neglected pair that we have. 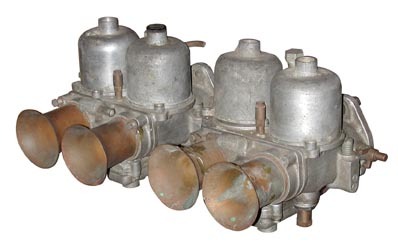 Also, the twin-choke carbs do become available for sale once in a while. A pair was sold on e-bay fairly recently out of England. We have one pair of neglected carbs, and we need two pairs. Also, it would be much nicer to have the ones which actually came off the cars we own. 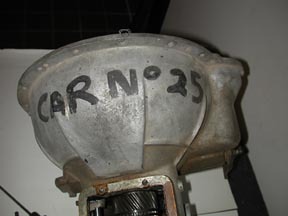 To provide an image of the carbs to anyone who may be able to help, I am posting a photo here. Yes, we had a good week at TRF—Albert found the TRS carburettors in an unmarked box in a storage area on Thursday evening. The outside box appeared to be something else, and we had looked at it several times, but Albert opened it, and inside, he found the box that had been shipped to me from Lanky Foushee years ago. 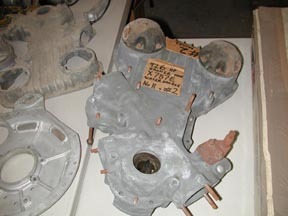 The carbs had been missed when other parts were picked up at Group 44 in Winchester Virginia in 2000. When Mr. Foushee was clearing up at Group 44, he found the carbs and shipped them on in a box that carries a lot of history. 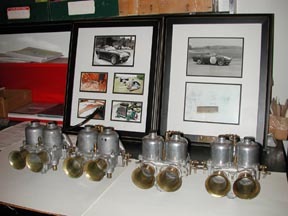 The photo above left shows the two pairs of twin choke carbs lined up on a table in Dolly’s office, where I often work at night. 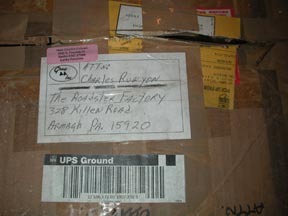 Also, I am including a photo of the Group 44 mailing label on the box which also includes a smaller label with Lanky Foushee’s return address at Hunt Country Cobras in Sanford, North Carolina. In its way, the box is worth more than the carburettors. This week, I decided to look inside a TRS LeMans racing car gearbox, and I removed the top cover of the gearbox from 929HP, number 25 at LeMans in 1961. 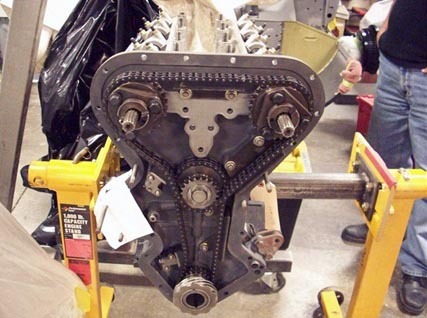 As I expected, the gearbox is a TR3 three-synchro box, likely with close-ratio gears. It looks to be in good condition, but we will take it apart later just to make sure, and we will count the gear teeth then. Interesting points are that it has a dipstick for checking the gearbox oil, something that was deleted from production cars by 1961. 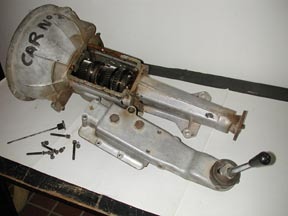 Also, the diameter and spline of the input shaft is different from stock TR3 boxes, as this gearbox must mate with a duel disc bronze clutch made by Borg & Beck. 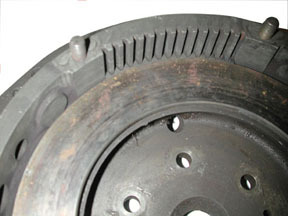 I will include some photos of the clutch another time. 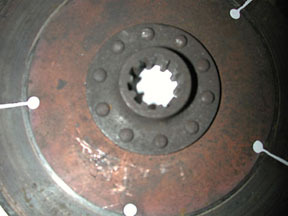 And, the throw-out bearing is an early Spitfire type, again to match up with the special clutch. 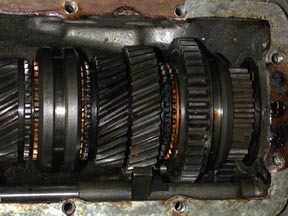 I’m posting a few photos of the gearbox here. From these, you will be able to see all that I have discussed here if you look closely. Some may be surprised that no overdrive was fitted. John Swauger also took some photos of the TRS brake calipers on X654 which is very near to the “rolling chassis” stage now. 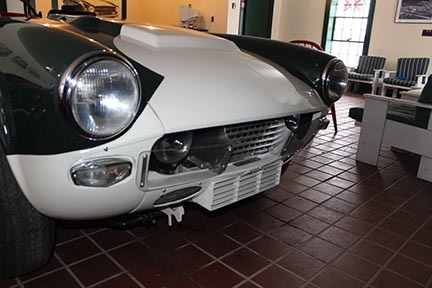 We were able to acquire EBC “Greenstuff” Kevlar pads for this car, although nothing like “Greenstuff” pads had been dreamed of in 1961 when the car raced at LeMans. The front pads are Aston Martin, and the rear pads are Humber Super Snipe, the humor of which is not lost on me, as I am sure that it is not lost on you. Anyway, I am including photos of a front and a rear caliper as additional . We have attempted always to keep the TRS original, except in the case of the red calipers which are a TRF tradition. All of our cars have always had red calipers long before the ones made by AP brakes used on Minis, Morgans, Porsches, etc. As we are on the subject of TRS gearboxes and clutches, Albert unpacked one of the TRS flywheels with its clutch tonight, as I thought you might like to see it. Obviously, this clutch was not meant for the street. 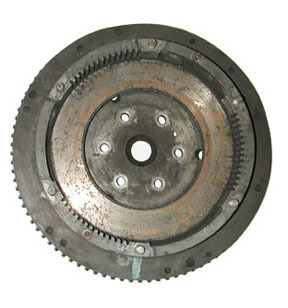 You will see that the flywheel includes a housing with internal splines to contain the two bronze clutch discs, a spacer plate between the discs which is splined to the housing, and a pressure plate which is also splined to the housing. 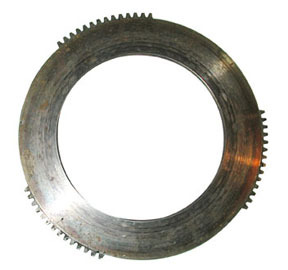 The fingers on the pressure plate include adjusting screws on which the throw-out bearing thrusts. The throw-out bearing is very small, and when I purchased 929HP, this had cocked on the input shaft, and the clutch had locked up. At that point, we had pulled the gearbox and replaced the throw-out bearing. No further problem occurred, but we never drove the car very much with its original drive train. 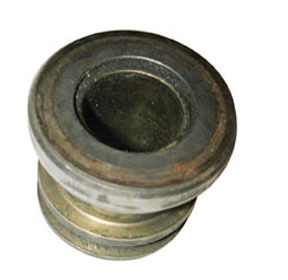 I think the throw-out bearing is an issue that we need to resolve before we run these cars again. Our TRS LeMans car restoration moved a step or two ahead this week, as we delivered our engine parts to a high-level restoration shop near Zelienople, Pennsylvania. Randy, Albert, and I spend an afternoon showing them what we have and discussing various questions. I think they will be able to put the engines back together, but the lack of workshop information or even torque-wrench settings is a major drawback. There is a legend that one copy of a factory manual exists for these cars, and I would be very grateful if anyone can tell me of its whereabouts. Randy Phillippi continues to progress on the restoration of 926HP, one of the two Triumph TRS LeMans racing cars owned by Charles Runyan. This week the body shell went off to be bead blasted and to have final body work done. 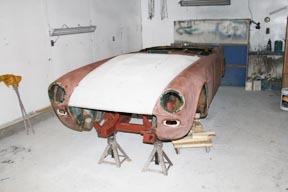 It is estimated that the painted shell will be back on the chassis by the end of July. Randy has been talking to several companies about replacement windscreen glass, and he has sent the windscreen frame from 929HP off to be duplicated to be used on 926HP. The windscreen and frame were missing from 926HP when the car was purchased. 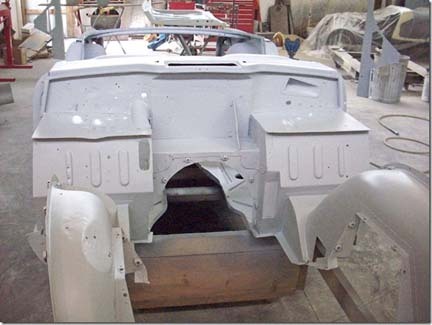 We are impressed by Randy’s approach to a restoration. He is always thinking ahead, arranging for needed components to be sourced or refurbished well ahead of time in order to minimize down time when a component is eventually needed. 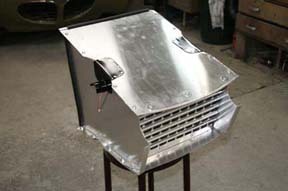 A case in point being the aluminium air duct fitted to the cars. 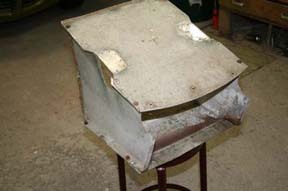 The original air duct from 926HP was intact but in poor condition. 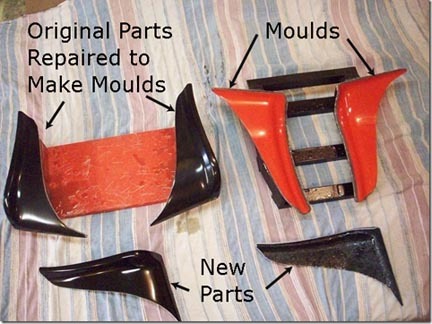 Randy spoke with several different companies about having a replacement made but in the end decided to reproduce the part himself. I checked on the Triumph TRS LeMans car restoration last Sunday, going to visit Randy Phillippi in his shop after he had called to welcome me home. Some very nice things had been accomplished while I was away, including the fabrication of a new air duct, and the restoration of the dash which is now complete except for the gauges. 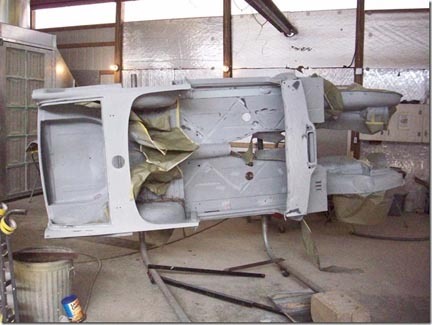 In addition, the main body section, which is part fibreglass and part steel, has now been lightly sandblasted, repaired, and primed. It happens that I received some photos of the body “tub” today which will function as our this time. We sent the wiring harness away for duplication some time ago. 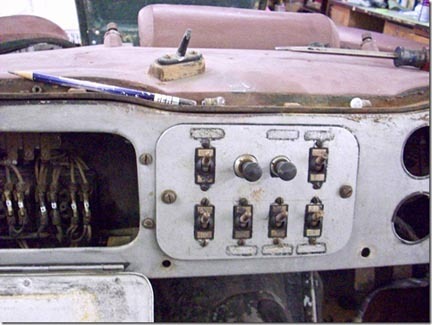 A new windscreen frame and glass must be especially made, and the engine and gearbox must be rebuilt. The Sabrina engine has been in the hands of a high-end rebuild shop for several months, and it is time that we went to check on its progress. Various work has continued on the TRS LeMans racing car project this week. The green paint was purchased in acrylic enamel, and we were told that the shop we use to purchase it now has only two customers left who use this finish. That was scary, and we purchased enough to finish this project all at once. 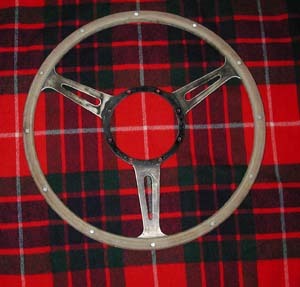 Wood Chuck Findley in TRF’s dash shop worked on the TRS steering wheel this week. It was quite weathered, and all of the old finish was gone. Wood Chuck sanded it carefully with 400 grit sandpaper, and it is now nearly ready for its finish. Actually, I think it is amazingly beautiful now, like the body of an E-type Jag with all of the chrome off. We will just varnish the wood, and the spokes will be painted black again as they were at LeMans in 1961. We have spent time this year in building a fairly brutal LeMans racing car which has a cockpit and controls something like a British fighter plane from World War II. We have watched hours of films showing the Triumph drivers fiercely controlling fairly crude machinery at the highest speeds they can produce. All of us who drive classic British cars have mastered the art of driving vintage machinery that many of our fellow citizens would be hard-pressed even to get started. With this background, I listened to news reports on NPR this week about the driverless cars of the not-to-distant future. One commentator described what it would be like to travel in such a vehicle. I believe he said that in five or ten years, we would be comfortable in such machines. I realize the advantages that driverless cars might have for some, but for me personally, I find the very idea extremely distasteful. I can’t help thinking of a Triumph advertisement for the TR6 model which appeared in Road & Track magazine during the years of TR6 production. The headline read, “People Should Drive Cars; Cars Shouldn’t Drive People.” What do you think? > I got some lovely photos of one of my Sabrina engines currently being test-assembled at the shop which we have entrusted with this work. The folks involved have experience with Jaguar, Mercedes, Ferrari, and Maserati. The parts in the photos seem to be very well-prepared, and Randy Phillippi who took the photos was satisfied that the work is going well. There is no shop manual for these engines, at least none that is available, and the rebuilder must be very good at his craft. I am encouraged by what Randy has seen and by the photos. 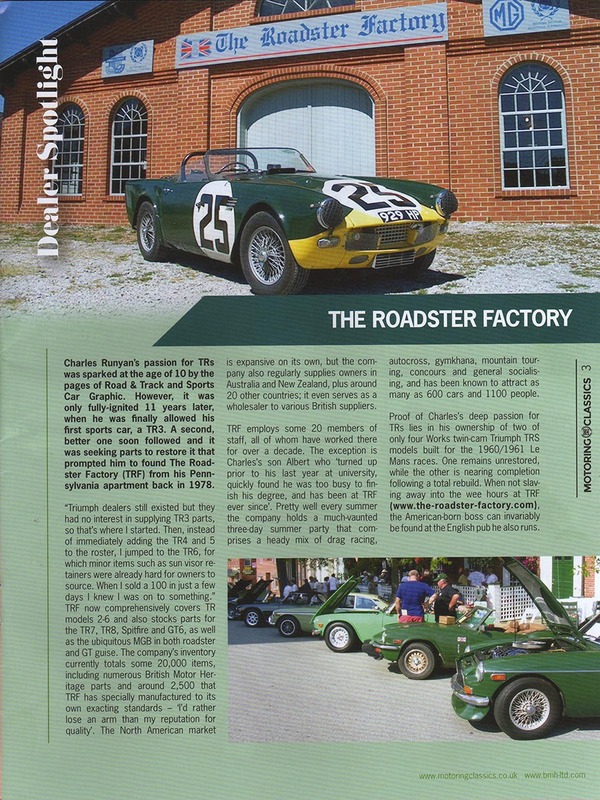 It appears that the project to produce a very high quality Triumph TRS restoration is on the road to success. Note that we plan to have the TRS on site for Summer Party 2013 at whatever stage it has reached by then. I spoke with Randy today, and he now thinks that the body will be installed on the rolling chassis by the end of July. 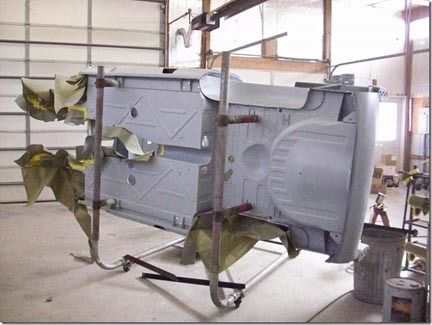 I noted a little piece of progress on the TRS LeMans car restoration project this week. Randy Phillippi had removed the rear fender stone guards from HP929 to have them copied, as they were missing from HP926. They are glass fibre, and a local shop was able to repair the old ones for making moulds, to make moulds, and then to make new parts. I have photos to show this process, and they are our . Too bad, these parts fit only TRS, as we could go into business supplying them. Unfortunately, there are only two customers and four cars, and half of them is me. 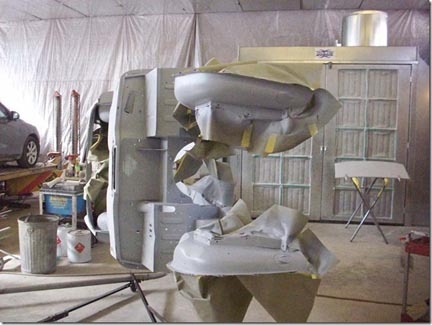 Randy Phillippi forwarded some photos this week of the body shell which is getting ready for painting. 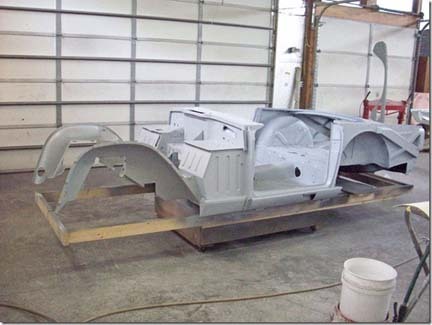 From the photos, the car looks little different from what it did when it received its first primer coat. 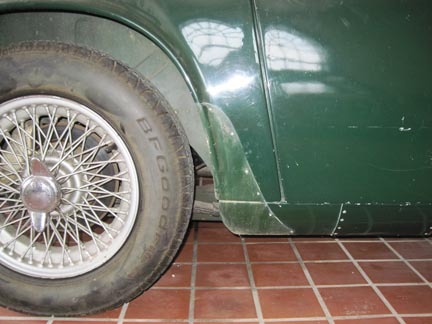 However, cracks have now been repaired along with dents, dozens of extra holes, and some crude work from when the original fender flares were added for 1961. 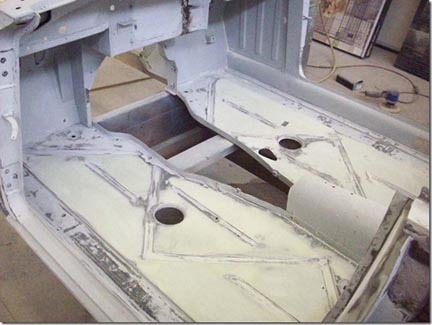 The body panels are now straight and flat and getting ready for the colour coat—BRG of course! Speaking of the TRS models, I received a fantastic packet of photos and reminiscences from Dave Gleed, a mechanic in the Triumph Competition Department during the golden age of Ken Richardson. Dave Gleed is 78 years old now, and he still lives in Coventry, having witnessed the destruction of nearly all of the original Triumph factories in the name of urban renewal. The photos he sent of the Triumph factory buildings, various cars, and many Triumph personalities are priceless to someone like me. TRF does not own the TRS with the registration 928 HP, but Dave Gleed was more closely associated with it as a racing mechanic than with the others. Above is a photo of Dave Gleed behind the wheel of 928 HP, Number 59 at LeMans in 1960. I will tell more stories from the information supplied by Dave Gleed and post more photos as I begin to digest all of the information received from one of the survivors of a glorious time and glorious events which remain relevant to serious enthusiasts of the Triumph marque. The Triumph TRS LeMans Racing Car restored by Randy Phillippi for The Roadster Factory is back in our showroom this week. 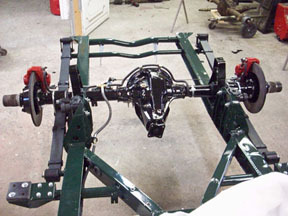 The body work and painting are finished, and the body has been refitted to the chassis with rear axle, suspensions, and brakes installed. The race number circles are painted on without the numbers. The car carried no. 28 when it raced in 1960, driven by Ninian Sanderson and Mike Rothschild, and it carried no. 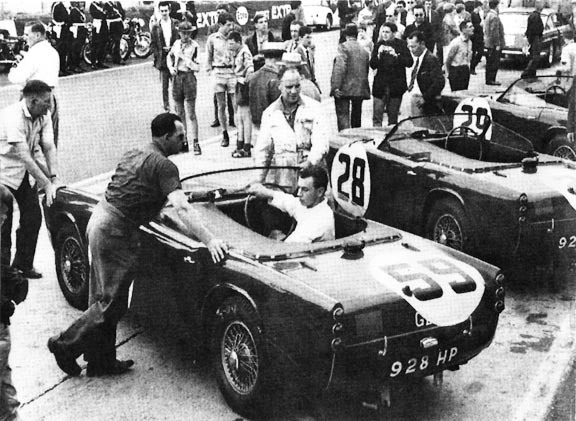 27 in 1961 when Keith Ballisat and Peter Bolton drove it to 9th position overall, the best of any of the TRS cars in either year. We have already made decisions which will require no. 27 on our finished car. 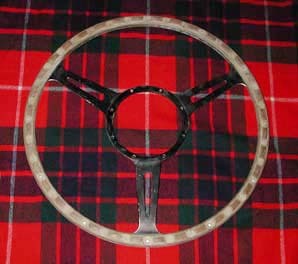 These were in fact made for us by Triumph, as certain modifications made for 1961 could not be reversed easily. There were certain details of the 1960 version which appeal more to me, such as the red seats, but it makes sense not to build a hybrid. 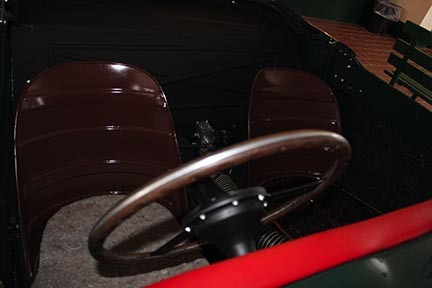 Besides rebuilding the engine and gearbox, a few other details remain, including the production of a windscreen and frame, as it had been lost before this car was purchased. Fortunately, we have a perfect pattern from another TRS also owned by TRF. Randy Phillippi engineered a seat frame, but we must decide final details and have it upholstered by our friend Larry Learn. I have located the engine block in England that was fitted to this TRS when it raced at LeMans in 1961. Provided it is in usable condition, I would like to have it in the car for the sake of originality. I hope to have a Sabrina engine built in England for this project by autumn, and I hope that the gearbox will be rebuilt by Bob Jasper, a very active TR enthusiast in Southern California whom I have known for many years. It has been a while since I have mentioned the TRS project in detail, and as it is back at TRF, I thought readers might enjoy reading this update. 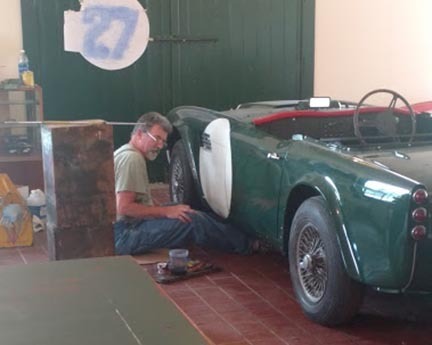 I have been involved in the restoration of a good many Triumphs, and predictably, this project has required a lot more time and money than the standard models with which I have been involved, TR3A, TR250, TR5, and TR6. I do think that all of the work which has been done so far is superb and, therefore, well worth the effort. When the car is finished, I have dreams of taking it to France for the Classic LeMans some year and also home to England. I don’t know if I will last long enough to accomplish all that, but I will keep working in that direction. 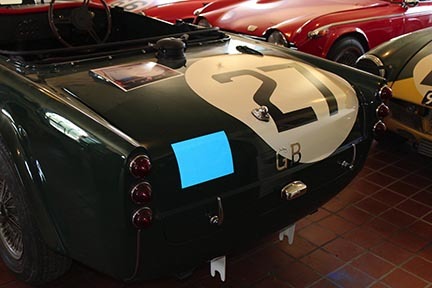 The racing numbers were painted on 926 HP, the Triumph TRS racing car currently under restoration at The Roadster Factory. 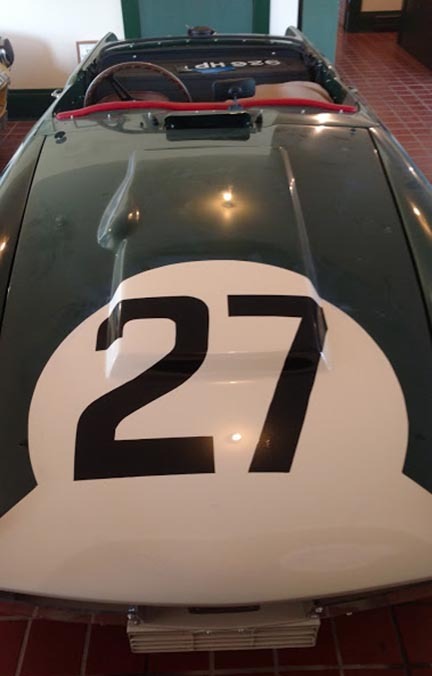 It raced at LeMans in 1961 with the number 27, and it is in this form that we are restoring it and attempting to make all details authentic for that year. The body work and paint are finished, and the number circles have been in place for sometime, but the car looked kind of naked without the actual numbers painted on the circles. Originally, these were painted on the cars by sign painters, and that is how we proceeded. The numbers were painted on by Kevin McGill, the local sign painter who painted the first signs for The Roadster Factory’s present location in the early 1980s. Albert took some photos of Kevin McGill at work. 926 HP still needs its engine, a windscreen, and seats to complete its long restoration. I have been working this week to gather all of the parts for the Triumph TRS LeMans car windscreen which I must have duplicated. TRF owns two of the TRS cars which raced at LeMans in 1960 and 1961. One of our cars, No. 27, placed in eighth position overall in 1961, the highest placing Triumph ever at LeMans. No. 27 was missing its windscreen when it was found in California in the 1980s. It is now getting close to a complete restoration, needing only a new windscreen, seats, and a Sabrina engine. I had nearly despaired over the windscreen frame, as one shop had it for three years and only produced the stanchions. The shop owner admitted after stringing me along that he had no idea how to make the frame, and it came home to TRF earlier this year. I was afraid that some of the small parts had disappeared, but I have now found them all. The windscreen frame will be duplicated by Mike Engard of Pollock Auto Restoration in Pottstown, Pa,, and I am delivering it on Tuesday. I still must have another windscreen glass made as well, but Triplex still has the capacity to duplicate it. I spent about three hours last night in sorting the parts and seeing how they all fit together, even holding parts of it up to both of the cars to recheck the mountings. 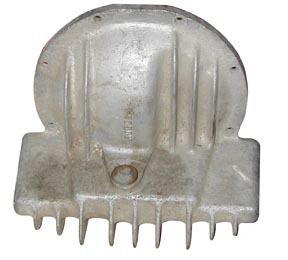 It is actually a very simple design, although somewhat hard to duplicate now, almost sixty years from the time it was designed in Coventry with various handmade details, probably “manufactured” by apprentices using hand tools. I always knew that the missing windscreen frame would be nearly as tough a problem as rebuilding the Sabrina engines, and that has definitely been the case with the new stanchions, frame, and glass costing a number of thousands of dollars all told. Worth it? Like the Jabbeke TR2, this Triumph is worth the effort, and I have considered it a part of my life’s work. At seventy-one years of age, I feel that I need to work though the rest of the project if it is to be completed and paid for in my lifetime.